Atherosclerosis is a disease of large and medium-sized arteries characterized by endothelial dysfunction, vascular inflammation and accumulation of lipids, cholesterol, calcium and cellular debris within the intima of the vessel wall . It is a condition affecting large and medium-sized arteries. It leads to the formation of atherosclerotic plaques which may eventually disrupt the blood flow to target organs either by causing progressive fixed stenosis or by rupture and vessel occlusion. It can cause myocardial infarction due to the involvement of coronary arteries, peripheral vascular disease through the involvement of lower limb vessel and renal disease with renal artery stenosis and stroke disease through involvement of aorta and head and neck vessels. The earliest visible intimal abnormality is a fatty streak seen in the artery and there is entry and accumulation of lipids. Lipids are proinflammatory and cause white cells to accumulate and foam cells (macrophages which release cytokines) formation with intimal damage. This leads to loss of local Nitric oxide vasodilation. Contributing is the fact that smoking causes increased reactive oxygen species (ROS). Over time the overexpression of matrix metalloproteinases  breaks down collagen established thinning and weakening of the fibrous cap as the mechanism that renders atheroma prone to rupture. Intimal stable/unstable plaques grow and obstruct the lumen with downstream ischaemia when there is increased O2 demand e.g. exercising causing angina. Intimal unstable plaque can rupture causing the release of thrombogenic material with in-situ thrombosis and vessel occlusion. Intimal unstable plaque ruptures causing localised thrombosis which then embolise downstream. 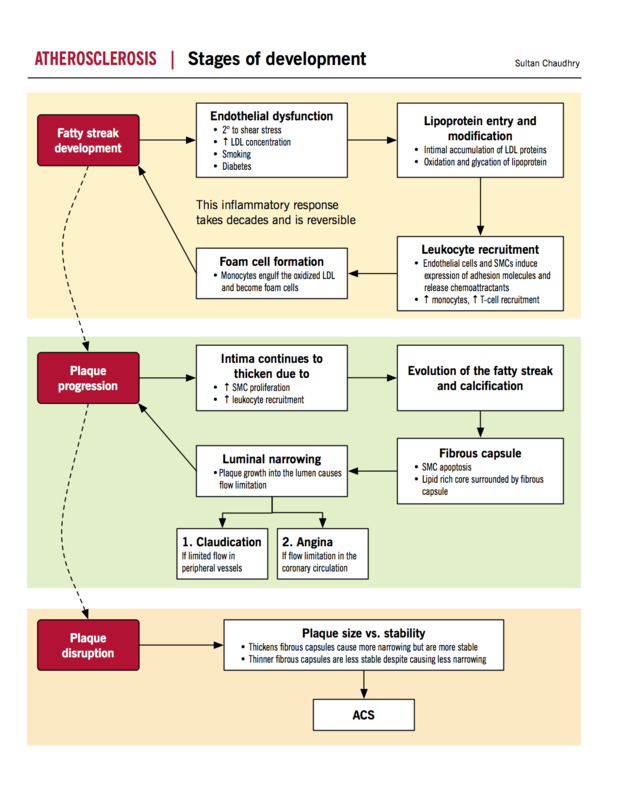 Biomarkers of Atherosclerotic Plaque Instability and Rupture can be detected. 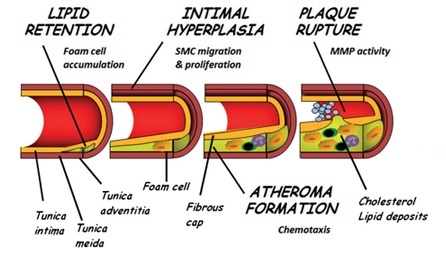 Atherosclerosis appears to localise to certain areas on the vascular tree which are associated with regions of low shear stress, oscillatory flow, or turbulent flow. 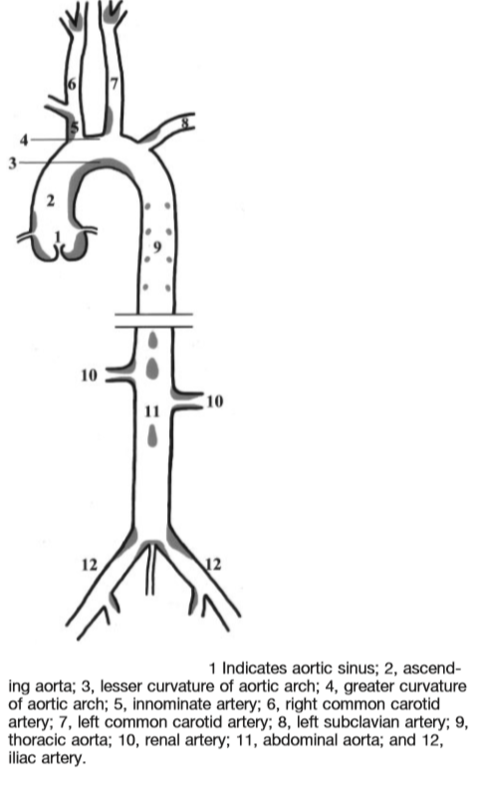 These regions of disturbed flow are related to the anatomy of the vascular tree and are found in areas of branching or high vessel curvature. This can be shown in the diagram below. 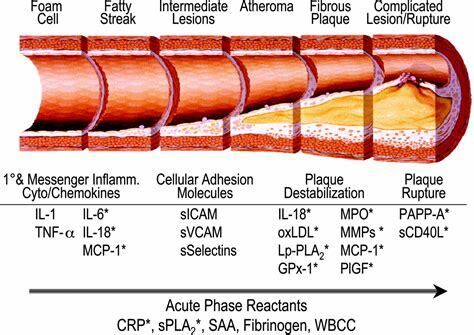 Atherosclerosis remains a major contributor to morbidity and mortality in the Western World. Many risk factors, such as hypercholesterolemia, modified lipoproteins, hypertension, diabetes, infections and smoking have been identified in the development of atherosclerosis. Dyslipidaemia (elevated LDL, decreased HDL) Excess LDL accumulates in the intima and undergoes modifications that initiate and perpetuate the development of atherosclerotic lesions. HDL does not accumulate in vessel walls can even move cholesterol out of arterial walls. Ischaemic stroke consider reperfusion therapies with thrombectomy/thrombolysis in Stroke. Initial rest. HASU for stroke. CCU for MI. Long term weight reduction, exercise etc. Role of Matrix Metalloproteinase-8 in Atherosclerosis. Mediators Inflamm. 2013; 2013: 659282.